Description: A blend of salt, spices, and natural chicken flavor to make soups and broths or to enhance your favorite dishes. 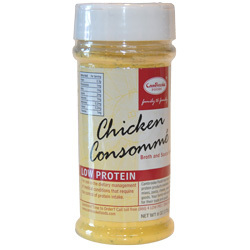 For a delicious clear broth: Stir 1 tsp Chicken Consommé into 1 cup boiling water. If desired, add your favorite cooked Cambrooke Foods pasta, rice, and vegetable strips. As a seasoning: Enhance the flavor of any recipe by adding our special seasoning to compliment gravies, soups, vegetables and sauces. Sprinkle over your favorite CBF pasta dishes and salad greens. It can also be mixed into salad dressings, stuffings and sandwich fillings. Storage: Store in a cool, dry, dark place for up to one year. Ingredients: Salt, dextrose, monosodium glutamate, yeast extract, canola oil, parsley, maltodextrin, extracts of turmeric and paprika, natural flavors, sugar, soy sauce (soybeans, wheat, salt), less than 2%: sodium silico aluminate (to prevent caking). Contains soy and wheat.